Guiding prepares you for anything spontaneous and unexpected. So, when two biologists were coming back to our guiding territory to finish some research and needed a guide last minute, and it was me, I was ready. The next day we headed off and embarked on a mission to rescue some white bark pinecones in the alpine. This species of tree is becoming extinct in the east of Canada and biologists are treking over to the bountiful forests in B.C to collect the pinecones to start nurseries. One of the factors that helps with the distribution of the pinecones is due to the efforts of the Clark’s Crow or Clarks Nutcracker. This amazing little bird has a very good memory. It takes the seeds from the white bark pine and stores them in cache’s around its territory and remembers almost all the locations. I say almost, because there are some seeds they forget about and it’s these seeds that blossom into lovely white bark pine trees. These birds also are very beautiful with a simple yet stunning display of white, grey and black. They are very vocal birds as well and you can hear them throughout the alpine. All this information was taught to me by the biologists I was guiding. They were willing to let me be part of their research and through this I have learnt about a wonderful species of bird as well as its impact on the environment. 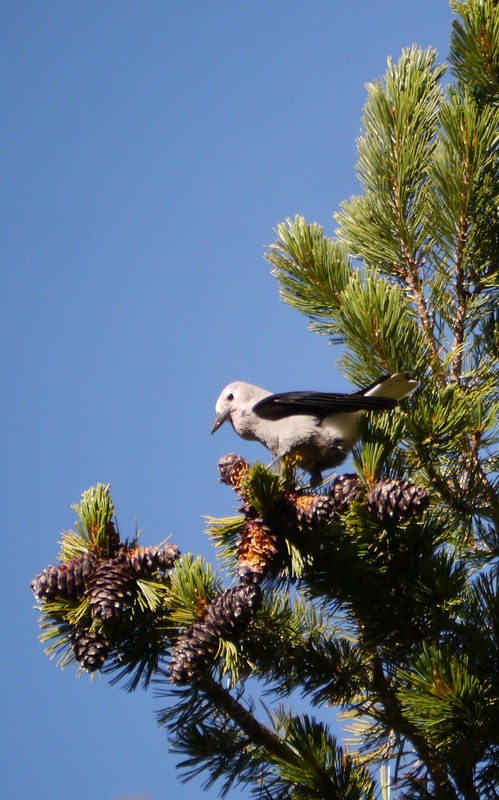 The bird is critical to the survival of white bark pine and to the other species that devour the protein packed cones, such as bears. This is what makes guiding special for me; that you are always learning. With something learnt, it means there is something to teach. 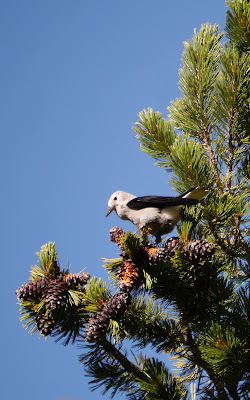 I look forward to my next pack trip I guide into the alpine as I will be able to tell and show my guests this little amazing bird and what it does for our environment ensuring we have white bark pine for generations to come. The Clarks Crow has taught me a lot and could very well do the same for you too!